If you look closely at the Catholic rite of Baptism, it parallels an ancient ritual of preparation for a funeral: Washing the body, anointing with scented oil, dressing, and lighting a candle. Of course, that parallel might seem a bit off or sour when you think about a precious, tender newborn infant being brought to church, perhaps for the first time. How to reconcile this paradox? We believe that Heaven is our true home, our truest reality, and that this present life on Earth is, though a great gift, a gift to be sacrificed or exchanged for something greater in the life eternal. For us, Baptism means that a person joins in the life, and in the death and resurrection, of Christ. As we loosen our grip on this life, we are welcomed home into eternal life with Christ. For parents, Baptism is a big commitment. When you ask Baptism for your child, you are asking for your child to be welcomed into the loving embrace of your church family, and in return promising to raise and educate your child in the faith we share. Choose godparents who will help you keep your promise. And know that we, your parish family, stand ready to help you, too. "It takes a village." If you would like to have your child baptized, please contact the parish office. We ask parents to attend baptismal preparation sessions. 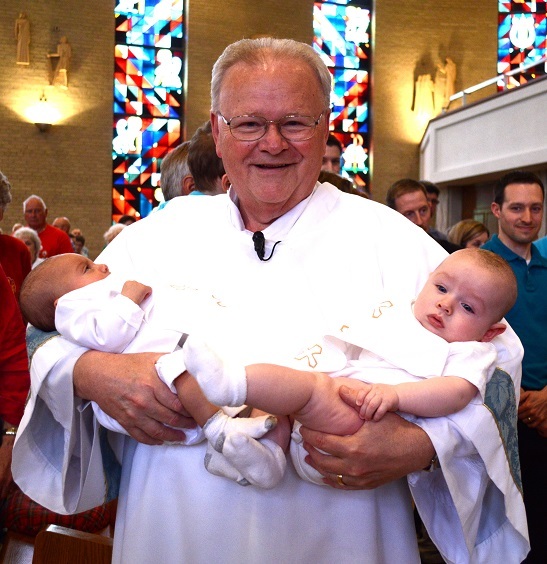 We try to schedule baptisms during weekend Masses so the parish family can celebrate with you and welcome your child. If you are a youth or adult who has never been baptized, or you were baptized in a Christian denomination other than Catholic, please contact the parish office. Tom Thibodeau will answer your questions and guide you through the process. The Cover Letter (PDF) welcomes you and explains the enclosed documents. The Celebration of Baptism (PDF) explains our process and schedule for Baptisms. We ask you to read the Godparents at the Baptism of an Infant (PDF) and then forward it to your godparents along with the appropriate Affirmation Statement. Please note the need to have their pastors affirm they are practicing members of their parish. Catholic godparents must complete the Baptismal Sponsor Affirmation Statement (PDF) and send it to the parish office. Non-Catholic godparents must complete the Baptismal Witness Affirmation Statement (PDF) and send it to the parish office.